The Dry Storage Bag is made of a heavy nylon material. The bag has an inner liner that is water proof and the easy screw-on lid comes with a rubber seal to keep out air, pests, and water. The bag is easily filled by simply hanging it from a sturdy door knob. 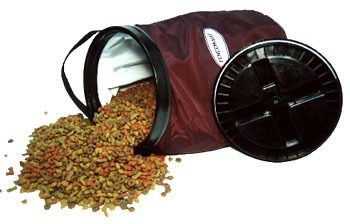 The bag can also be used for bird seed, oats for horses and many other uses. It comes in 25lb. and 50lb. sizes and is burgundy in color with a white logo.